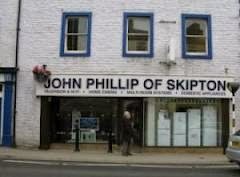 In Skipton in Yorkshire where I was brought up there were three record shops in the fifties and sixties, Woods (dedicated), John Phillip (which sold other electrical goods) and Ramsbottoms (which also sold other electrical goods and had a coffee bar too). I patronised all three and took it for granted that a town the size of Skipton would have as many record shops as it did butchers and greengrocers. It’s a while since I’ve been back up there but the last time I went – about eight years ago – only John Phillip had survived and when curiosity took me to their website recently there was no mention of CDs anywhere which suggests they’ve stopped stocking records entirely. Woods long ago became a Chinese restaurant and Ramsbottoms a Boots. Maybe another record shop has opened up somewhere in Skipton that I don’t know about. Woods was my favourite: classical and light music on the ground floor and rock and pop in the basement. I bought my first LPs (no one ever called them albums in those days) there – Elvis, Buddy H and Everlys – for 35 old shillings, which is £1.75 today. I loved to browse in the LP racks, checking out what they had, and of course you could listen to records, 45s mostly, before you bought them, as you could in Phillips and Ramsbottoms. Like most boys in rural areas I started driving early, long before I had a licence, on farm tracks so by the time I reached 17 the test was a doddle. In those days a gallon of petrol cost about six shilling, or 30p in today’s money. Nowadays a litre of petrol costs about £1.30, and there are 4.5 litres to a gallon, so I’m now paying nearly six quid for what once cost me 30p, twenty times as much. The last cheap CD I bought in Sainsbury’s cost me £2, but if CDs had kept inflationary pace with petrol even this discount CD would have cost me almost £40, and a full price one – what is full price today… £8.99? – between four and five times that, ie getting on for £200. Meanwhile those t-shirts with ‘official’ band logos in what used to be HMV are selling for the price of maybe three or four new CDs. Can anyone tell when it was that t-shirts that promote acts became more valuable than the music they produce. And why? I've always taken the view that acts should pay you to advertise them by walking around with their logos on your chest, especially if you're female, not that this is likely to cut much ice in an era when the average CD seems to be worth less than the price of a pint of beer.